Please see our SPAY & NEUTER section for more information and low/no-cost spay-neuter resources. Welcoming Home a New Dog Prevent Problems from Day One. Rescued Pit Bull Mix, Stella. Photo copyrighted. You may be very surprised when you strip away the myths. The show strain is labeled the American Staffordshire, while the non-show dog strain is labeled the American Pit Bull Terrier, and they now recognized as separate breeds. 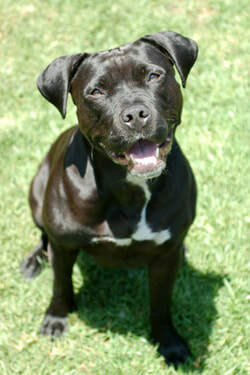 Today the American Pit Bull Terrier is being bred with the same gentle qualities as the American Staffordshire Terrier. Both breeds make wonderful pets with the right kind of owner.